Thomas Mulcair, leader of the NDP and official opposition, arrived in Iqaluit yesterday, along with Romeo Saganash, MP and Deputy Critic for Intergovernmental Aboriginal Affairs with the NDP. As part of their cross-country listening tour, Mulcair and Saganash held a town hall at the Francophone Centre. By 19:00, the Francophone Centre was packed with people, many left standing around the edges because all the seats were taken. As I glanced around the crowded room, I noted the age and ethnic diversity, the flecks of orange on bags and tshirts, and the warm, welcoming environment. What I really noticed, though, was what was missing: there was no militant security detail, no media fanfare or entourage. In fact, it seemed only local media stood behind the cameras and microphones, jotting down notes and nodding along with the rest of us. On seismic testing: Mulcair stated that "the science should be allowed to prevail" and noted that he had imposed a moratorium on seismic testing in the Gulf of St. Lawrence in 2004, when he was Quebec's Minister of the Environment. He expressed his disappointment that the North has become "the world's laboratory for climate change" and vowed not to continue that trend. On food insecurity in the North: Recalling Federal Minister James Moore's comment that it is not the Federal government's job to "feed my neighbour's child," Mulcair responded by saying, "I think it is my responsibility if my neighbour's child doesn't have enough to eat." On child welfare and social determinants of health: Mulcair's NDP is focused on the relation between social settings and outcomes. For this reason, if elected, an NDP government will implement a National Childcare Program - and Mulcair personally promised that Tumikuluit Saipaaqivik, Iqaluit's Inuktitut daycare, would get the 75 spots it needs to fulfill its wait-list. On affordable housing: The NDP believes that it is the obligation of the federal government to work with provincial/territorial and municipal governments to create a National Housing Policy. That one is not currently in place baffles Mulcair, as he sees Canada as "a wealthy country" with no excuse for poor housing. On northern broadband connectivity: For Mulcair, "economic development includes the tools," and this must include high-speed, reliable Internet, an important resource for business and communication. Exploring other options for broadband in Canada's North was highlighted as a priority by Mulcair. On an inquiry on missing and murdered indigenous women: Without hesitation and with passion, Mulcair reiterated his stance that an NDP government will launch a commission on missing and murdered indigenous women in their first 100 days of power. On Nunavut in general: Saganash stated during his opening speech that "the future of Canada is Northern Canada." Mulcair went on to say that the North's greatest resource is its people, and thus sees socially-driven policies as smart investments. Throughout their answers, both Mulcair and Saganash reflected on the particular and peculiar realities of the North, be they environmental, political, or social. @ThomasMulcair Is there some reason you don't discuss the Ukraine nor the Israeli rampage? Over the last two days, Mulcair in Iqaluit has been attentive, aware, and present. That being said, Mulcair and Saganash are not here to smile and make friends - they're depending on their community- and people-driven approach to Canadian politics to win them votes in a territory that has never seen orange. No matter your political standing, it is refreshing to see a national leader whose agenda revolves around consultation and communication. By actually listening to northerners and prioritizing their needs, Mulcair and the NDP are hoping to inspire Nunavummiut to "pay attention to the actions and not the photo ops." To learn more about the NDP's presence in Nunavut, check out the Nunavut New Democrats Facebook page. 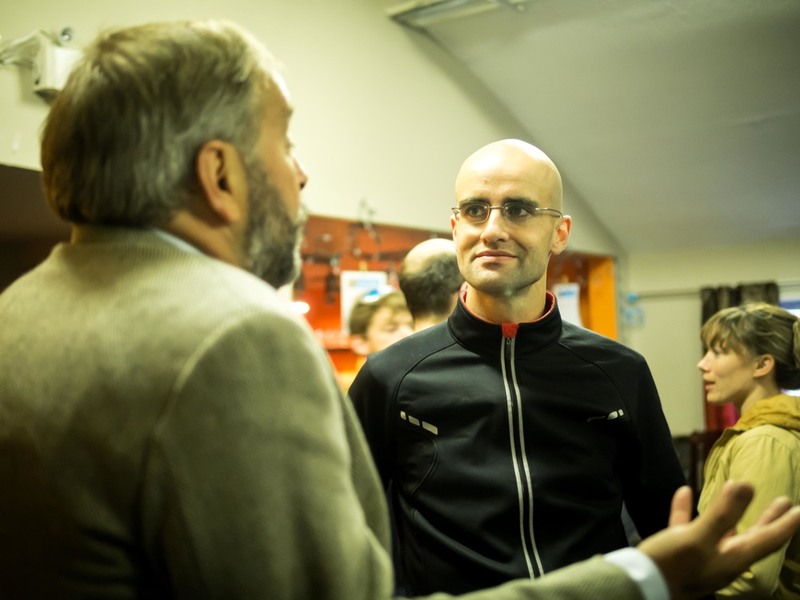 And let us know what you think about Mulcair in Iqaluit via a tweet or comment!